Darren Sammy will forgive West Indies the outcome of the already-lost series against South Africa, even if they slip to a 4-1 defeat at Centurion, as long as they reverse the result in a month's time. South Africa and West Indies meet on February 27 at the SCG by which time Sammy expects the mood between them to be totally different as they deal with different expectations. "I don't think I have had a World Cup where South Africa have not been favourites and this time it's no different. But in a World Cup if you play three good matches in the first round, you are into the knockout stages and with that, cricket is played on the day and anything is possible." Like many others, Sammy has already identified that when South Africa have an off day at the top of the order, they can be exposed. "The last game showed how a guy like Amla is key in the top order. When you are bowling to [Rilee] Rossouw and Morne [van Wyk], it's different. Amla is such a solid and classy player up there, he doesn't give you the chance to get wickets upfront which creates a platform for guys like AB and Faf du Plessis." But in general, Sammy cannot afford to be "really bothered about South Africa," when it comes to the World Cup because he has his own team's performances to think about. "I am more focused on if we can be consistent in all three disciplines. With the amount of match winners we have in our squad, we could be a force to be reckoned with but we've got to play as a team." 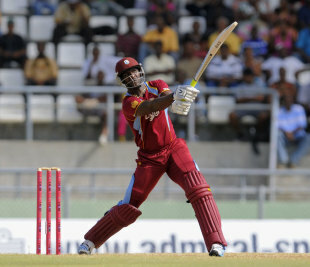 That will mean a collective pulling of weight, something West Indies got right in the previous match. Instead of relying on Chris Gayle to lead the chase, they had other performers, including Sammy, who was heartened by what he saw. "Chris has been the star for us but it's always good when performances come from different players. That makes a team strong," he said. "To be 70-something for 5 and to chase that total took a brilliant effort from us." West Indies were only able to do that after they were blown away in the three games which preceded the Port Elizabeth ODI, lost the series and were forced to introspect. "We had a meeting amongst ourselves and guys laid everything on the table. The captain asked us to show some pride and man up and we did that in the fourth game," he said. One of the reasons they followed those orders was because Jason Holder, the 23-year-old who has only been in charge for four matches, led the redemption himself. "It's a tough job and he is a young man but the way he responded two days ago, getting wickets upfront and ending with four wickets, shows that he has got some character behind him. I think that's what the selectors and the board saw when they appointed him as captain. He has a good cricket brain," Sammy said. "We as the senior players will help him and support him." Ultimately Holder will need every bit of commitment he can get because beating South Africa alone at the World Cup won't take West Indies as far as they want to go. Sammy does not think there are any limits on their performance once they reach the level of consistency they need to get out of the group stage. "When it comes to the World Cup, it's a different atmosphere, a different venue and more pressure. We all know when it comes to World Cup, once we get to knockout stages we tend to move on. Hopefully we can do something special," he said. "The West Indies people need us to do something special."